We have successfully avoided the lure of RunDisney events since 2014 Disneyland Dumbo Double Dare Weekend. It took the lure of Star Wars to bring us back. 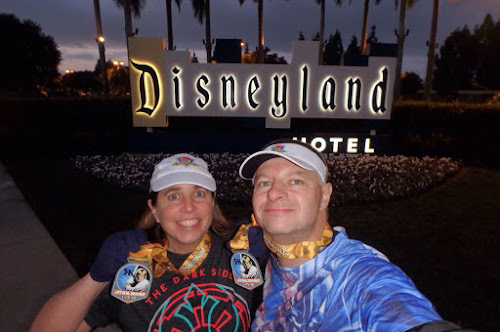 Holly registered for the Rebel Challenge Race Series (10k, half marathon) in anticipation RunDisney would have a companion series in Disney World that would partner with these races via special medal. She was right. in April Disneyworld will host the Dark Side Challenge Series and link the two together via the Kessel Run Challenge that comes with a Millennium Falcon medal. 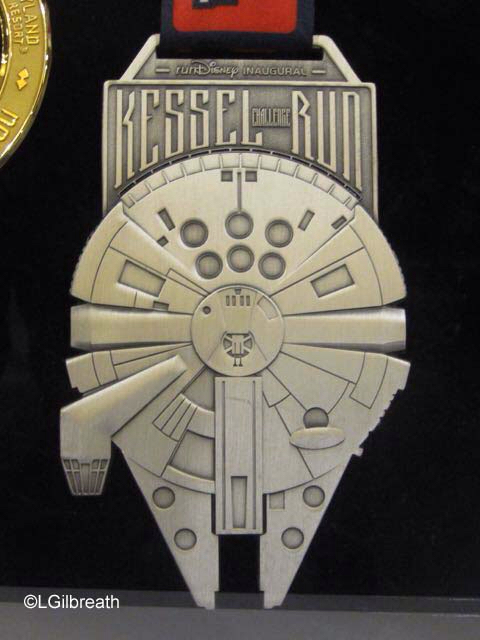 The photo of the medal we stole from the internet was taken by our good friend Laura. Check out her in-depth race report (something you won't get from us) at her great blog on AllEars.net: Part 1, Part 2, Part 3. Getting to Disneyland was half the battle. Originally we had a round-trip on American booked Chicago-John Wayne/Santa Ana that landed in California at a perfect time to accomplish a lot on Thursday and left Monday at a later-afternoon hour. Two months before the trip American rearranged the whole schedule, cancelled our flight, causing us to book a one-way to LAX, then a return to Chicago on United via LAX. The flight into Cali was later than originally scheduled and we were worried we'd be wasting a day of park ticket. We landed a little early, good news, but navigating a rental car pickup at rush hour in LAX took an hour. Compounding our bad luck was the 105 closed due to a car fire. Siri diverted us through an unsavory neighborhood (Imperial Highway). 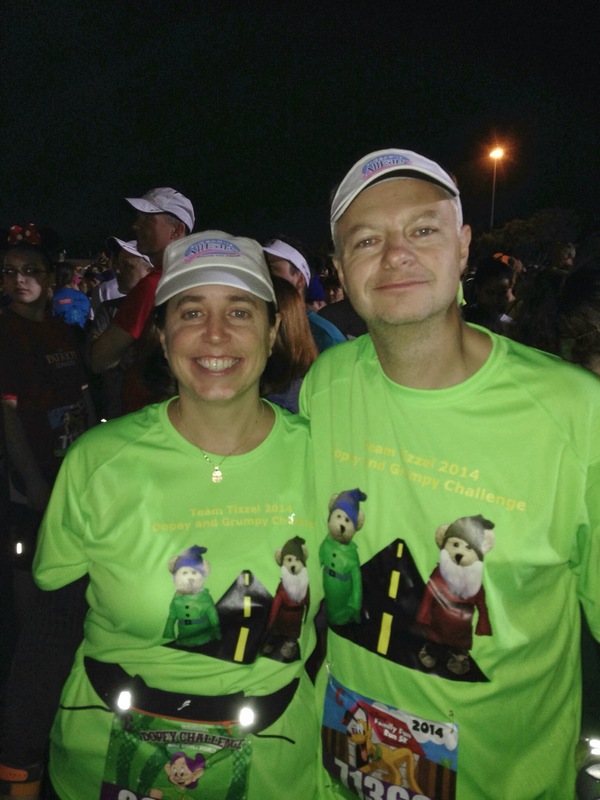 We'd be lucky to arrive on time to get our bibs for the 5K race the next morning. We pulled into the Disneyland Hotel (our home for a few nights and location of the race expo) around 7:10. Our grand plan: Run into the expo and pick up our stuff, put it back in the car, and then run to Disneyland to catch the new night time parade and fireworks starting at 8pm. We are happy to report we made it. Main Street is where the first chant of "I hate Disneyland" occurs (we prefer the FL parks and believe DL has some of the worst processes and procedures). While waiting by the train station for the parade Dave really wanted a Diet Coke. They don't have food/drink stands every 30 ft like Disney World. He had to go to the other side of the circle and wait in a horrendous line at the churro cart, where the cast member was delighting guests with his cinnamon sugar coating techniques. The lights dimmed signaling the parade's arrival so he went back to meet Holly, defeated and bitter. At least the new Paint the Night Parade was awesome. It had all the fun of SpectroMagic with a good mix of Disney and Pixar floats. After the parade we moved up Main Street for a better view of Disneyland Forever Fireworks. 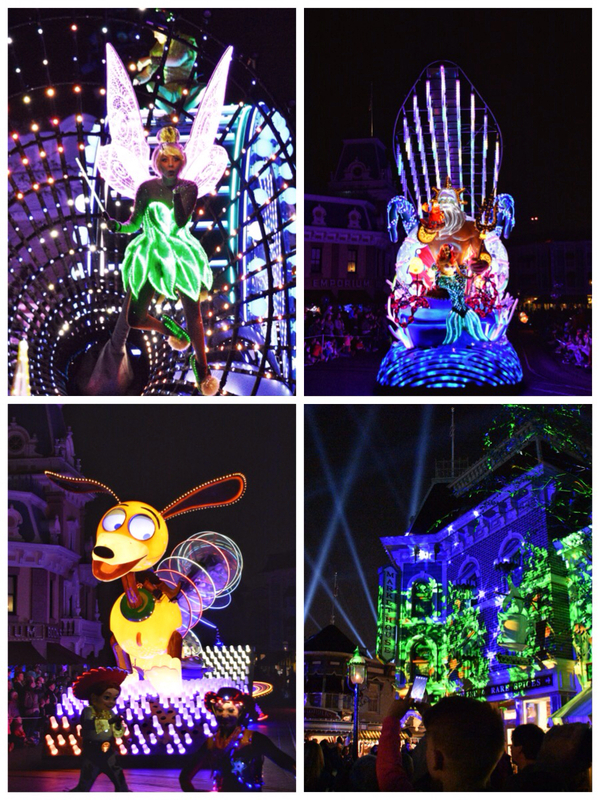 Great show, mostly due to the projections all along Main Street. As soon as the fireworks ended we bee-lined to the Main Street Starbucks and got Dinner Part 1: breakfast sandwiches. We walked back to the hotel, grabbed our bags, checked in, then met friends at Trader Sam's for Dinner Part 2: flat bread pizza. 5K: We barely had 4 hours of sleep when the alarm went off at 3:50am. By 4:30 we were at the Runner's Village near our hotel parking lot. 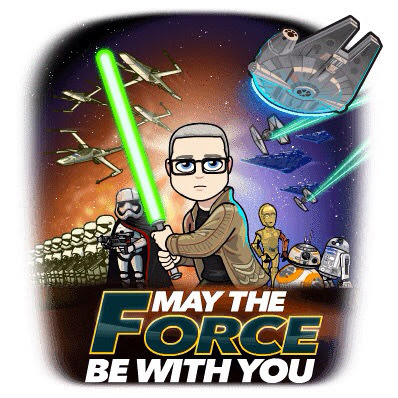 Lots of people in Star Wars clothes/costumes. We were both in Corral A this morning which is a good thing if you want any chance of character photos since the lines build quickly. 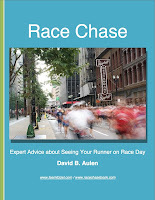 We were staying together this race - something we are not good at because of Our separate pace / interval preferences. We did ok this day. Mile 1 was mostly boring surface streets and backstage. We skipped the first character line, Chewbacca, since he's in the park daily. 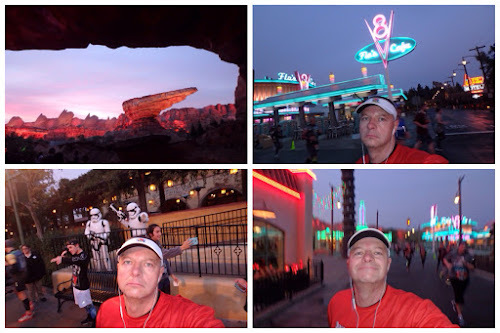 Mile 2 was mostly Disneyland. We stopped for a picture with Ezra and Sabine from Rebels, but the castmember moved the camera and blurred the pic. Luckily, our friend Laura read someone's blog and found that someone took our picture and posted it. Very random. Mile 3 covered California Adventure Park and Downtown Disney. In the corner of Hollywood was a BB-8 photo opp. The line wasn't so bad at this point since we chose to skip other photo opps along the way. Getting this photo totally made Holly's day. 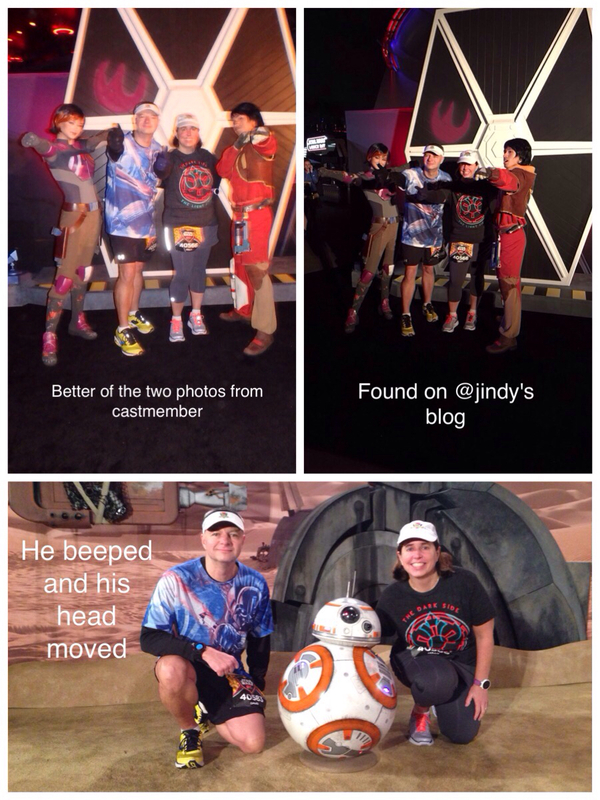 We skipped the C-3PO / R2-D2 stop since we've snapped photos with them separately before. Our splits were something like 12+minutes mile 1, 18+ mile 2, 27+ mile 3. We spent the rest of the day enjoying the parks and time with friends while we added another 12+ miles of walking during the day. 10K: Here we go again. 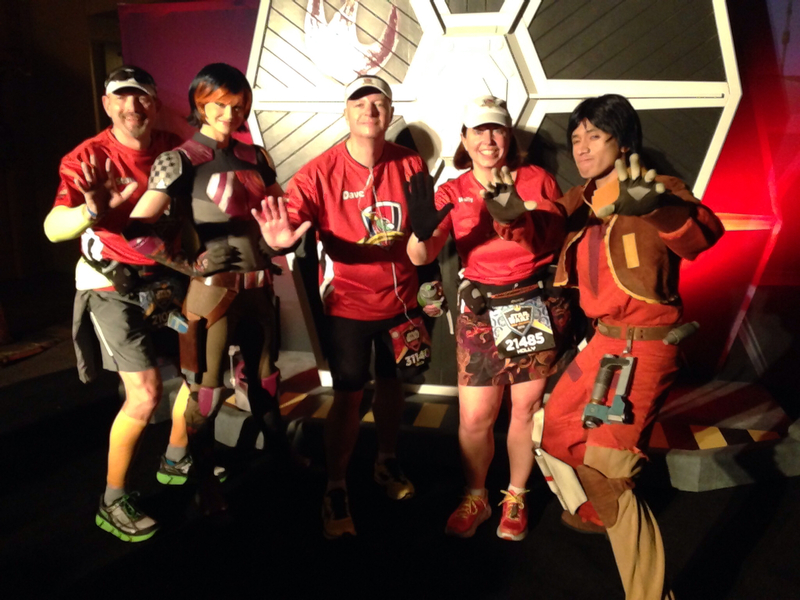 3:50 alarm, 4:30 Runners Village, in the corral by 5:00. We were in Corral B today and we had separate plans for the race. Holly would run it with our friend Stan and Dave would just finish at his own pace. They tried to cram most of the course within the Disneyland property. This meant we took about 13 hairpin turns on the course as it repeated on itself many times. Still a lot of backstage areas incorporated on the course. In Disneyland Dave found Stan and Holly on line for the Ezra/Sabine photo opp and joined them. That was the last time we saw each other. Stan and Holly kept running through and Dave took it a bit slower and stopped for some photos. Overall both races were fun. People were really into the theme and the weather wasn't horrible. They incorporated a lot of park time, albeit a lot of that is backstage. The rest of our Saturday was spent touring the parks, which actually means sitting at Pacific Wharf for hours with friends drinking beers. Most of us still had another long race the next day.